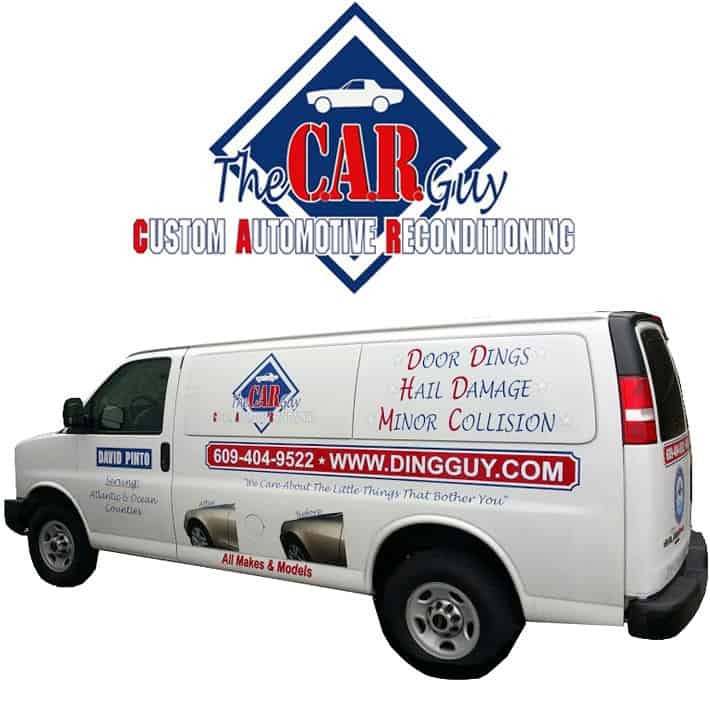 Your vehicle is in good hands when you call The Car Guy 609-839-3839. Welcome to New Jersey’s leader in PDR, The CAR Guy Paintless Dent Repair. We fix everything from small dings, to complex dents and hail or acorn damage. Some things that set us apart from the others. Our No Drill policy! If another company tells you they need to drill a hole for access, STOP! Current Vehicle manufacturers have all stated that drilling a hole is a SAFETY issue! Structural damage or airbag timing can be affected, putting you or your loved ones at risk. The CAR Guy PDR is always leading the way for proper, safe dent repair, and we utilize the most modern tools and techniques. We employ diagnostic scan tools to ensure your vehicle performance is working as intended if we have to disconnect any electrical components. Paintless Dent Repair (PDR) first appeared back in the 1990s as an innovative way to repair a dent or ding on automobile production lines in Europe. Later, it became a more effective, less expensive method for removing a small ding or dents from cars made with a thinner grade of sheet metal and more flexible paints. Today, the process has evolved into an industry. Now, specially trained technicians utilize state-of-the-art tools to reach a ding or dent on any vehicle and repair the ding or dent. It can provide a very high-quality repair for a fraction of the cost of a conventional body shop repair. Time is an added bonus, as Paintless dent repair is done in less than an hour for small repairs, and even large damage or hail can be a 1-day repair. Body shop repairs involve removing the paint to fix the dent then repainting the vehicle or panel. The cost of paint and materials are the largest reason for the increased cost associated with body shop repairs as well as the amount of time required to process a vehicle through all the stages of the repair. David Pinto, the owner of, The CAR Guy, has personally been servicing South Jersey in paintless dent repair since 2000. I am a member in good standing with the National Alliance of Paintless Dent Repair Technicians (NAPDRT) and PDR Nation. I am always up to date on all of the latest tools and techniques, as this trade is always evolving, and has become much more than just minor dings and dent solution. Much more complex damage is repairable, by skilled techs with years of experience. This comes from years and years of trial and error, and practice. The CAR Guy combines quality repair work, customer service, and convenience. Mobile service or drop off locations are available for Atlantic County, and Southern Ocean County, New Jersey. Do not hesitate to use Dave's service, he works wonders and is efficient, honest, and thorough. I used him twice, once on a BMW X5, and just today on a ding in a crease of the quarter panel of a BMW X5. He said he would take a look at it and although a somewhat difficult area to access, and that there would be no charge if he couldn't do it. Well, guess what, he completed it and it's like new. This man works magic. Just call him and you won't regret it.